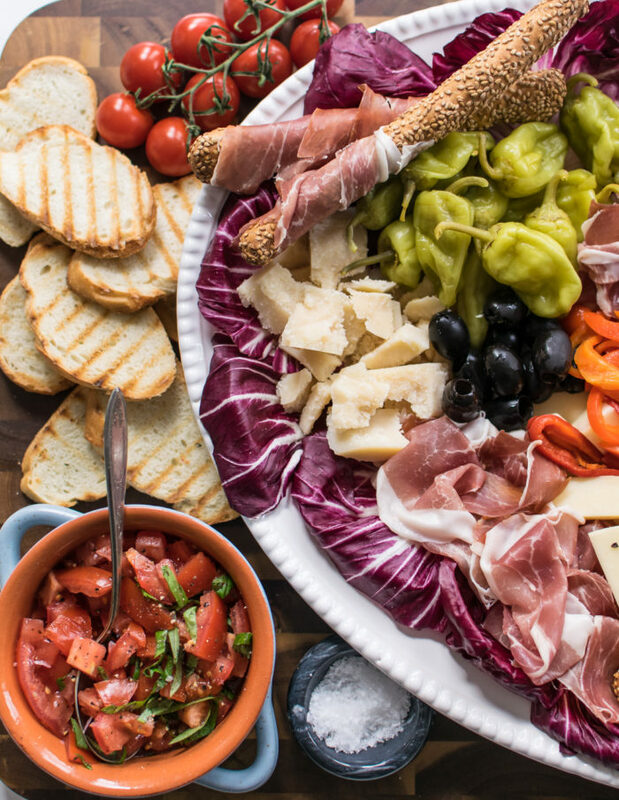 Antipasto (Antipasti is the plural) is the first course of an Italian meal or an appetizer—it literally translates to, “before the meal.” Growing up, my family would always put out an antipasto platter before big meals like Christmas or Easter, a dinner party, or a big Sunday dinner. Okay fine, we would also sometimes have antipasti before regular old weeknight meals too. 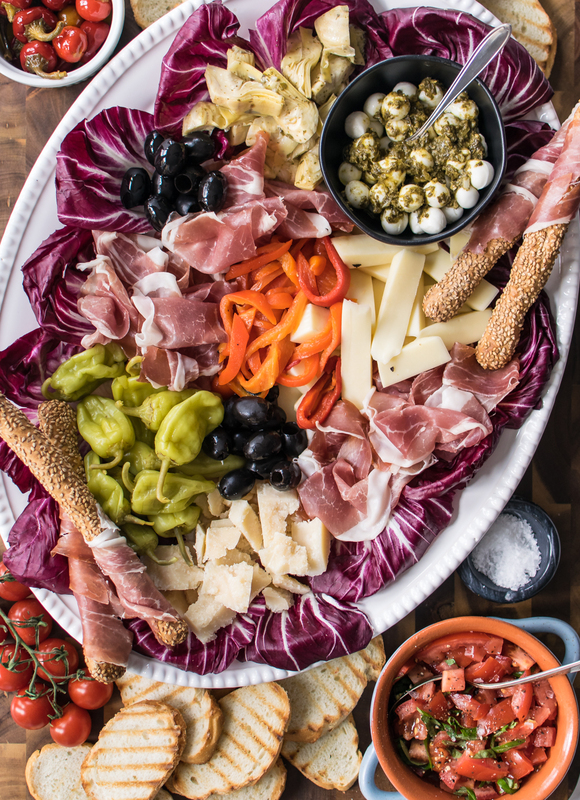 One great thing about this Italian antipasti is that the majority of the ingredients are pickled, cured, or aged so they will keep in the refrigerator for a while and it’s super easy to put out a platter whenever you need a little something before the meal. While it’s not written in stone, an antipasto platter usually consists of cured meat, cheese, and pickled or marinated vegetables. 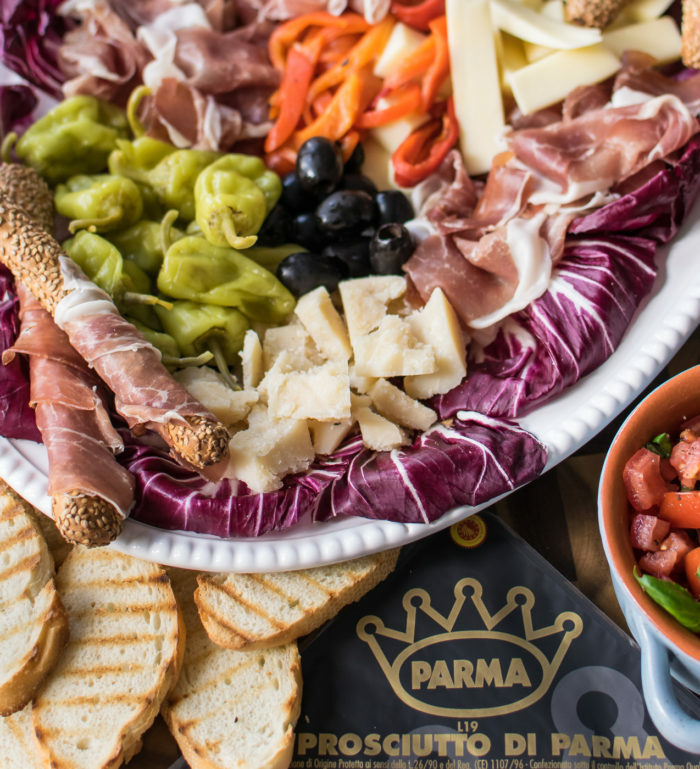 I created the perfect platter with an assortment of veggies, three cheeses, and tons of Prosciutto di Parma! I chose to use prosciutto di Parma because of the quality of the ham and how it’s made. It completely sets the standard for prosciutto! Prosciutto di Parma can only be produced from Italian-born and bred pigs and is made of only pork, sea salt, air and time. That’s it! No nitrates, nitrites, or other junk that may be lurking in other prosciutti. 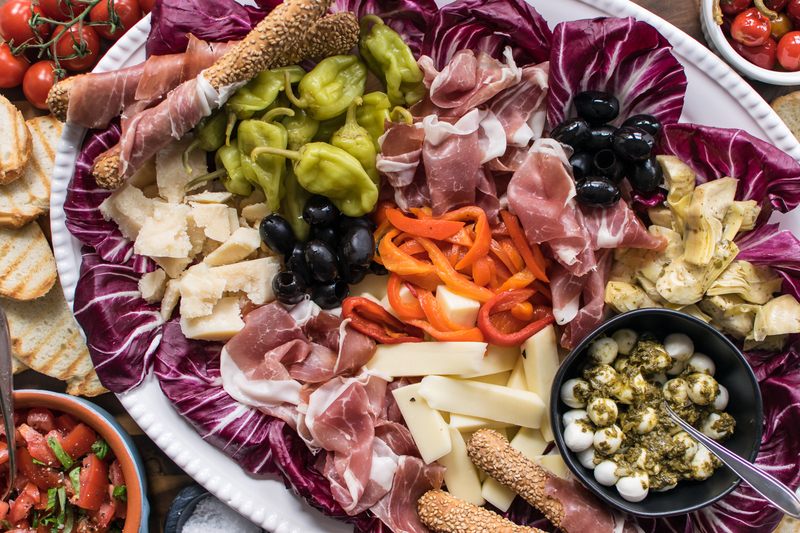 Next time you go to buy prosciutto (like when you’re ready to make this antipasti!) be sure to look for the signature Parma crown. I found my Prosciutto di Parma in pre-sliced packaging which is easy to identify by the gold Parma crown. Some stores even slice it to order at the deli counter. Just make sure you ask for Parma! I always like to include a simple chopped tomato salad when I’m putting out antipasti so that people can make a quick tomato bruschetta with the toasted bread. And guess what? Other than preparing the tomatoes and toasting the bread, all you have to do is assemble! When it comes to antipasti, there is no cooking, minimal chopping, and maximum deliciousness. That’s a win in my book. For the most part, you’ll be making piles of the ingredients all on the same platter but, I like to keep a few things in separate bowls. For example, I keep the Calabrian chilies separate because they are very spicy and I don’t want their oil to run and make everything else spicy. Same thing goes for the fresh mozzarella with pesto. It’s not spicy, but pesto has a strong flavor and I like to keep it contained. Some people may not like pesto or spicy peppers and an antipasto platter is supposed to be for everyone! To assemble, I like to start by laying some radicchio leaves around the edge of the platter. It just looks so pretty! Next I start making my piles. There are no measurements for this part, you can pile up as much or as little as you like! I try to be conscious of color when I’m assembling. If I just put down a pile of white cheese, I’ll be sure to put green pepperoncini, red roasted peppers or pink prosciutto next to it. Keep making piles until the whole platter is full. I like to wrap a few bread sticks with prosciutto and lay them on the platter as well. Who doesn’t want a prosciutto wrapped bread stick? 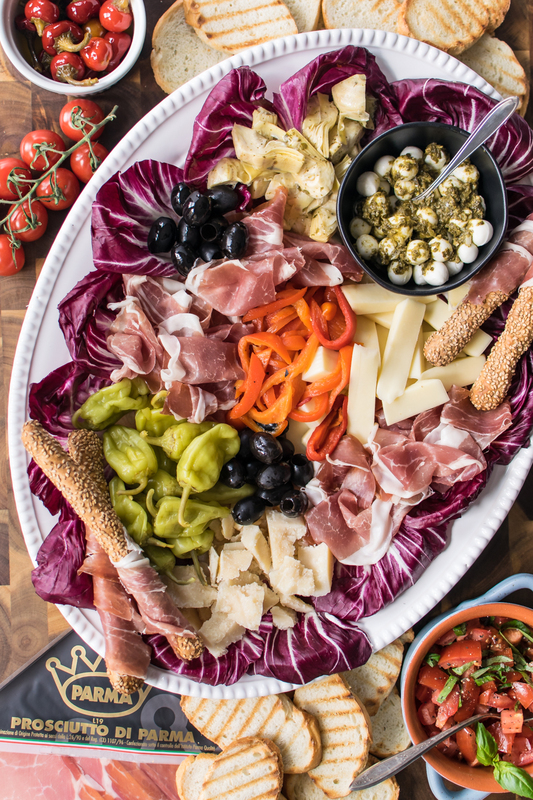 Now that you’ve made it through the hardest part—assembling the antipasti without eating it all—it’s time to serve! Snap a quick picture before your guests get to it though because, wow, it’s gorgeous! 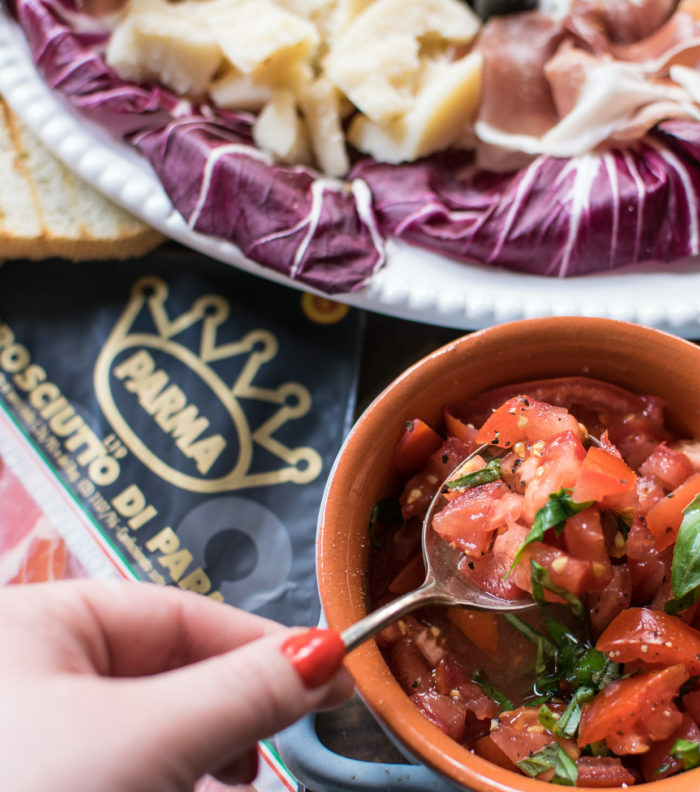 Now here’s the best news, YOU have a chance to win a $500 cash gift card from Prosciutto di Parma! Like, what?! You’re gonna want to enter that, ASAP. Pronto. On the Double. Follow this link for your chance to win! A special thank you to Prosciutto di Parma for sponsoring this post and supporting Carolyn’s Cooking! Recipe, photos, and thoughts are all my own. P.S. Out of curiosity, does anyone know how many times I said “platter” in this post?! Make the tomato salad. Mix all of the ingredients together in a bowl. Assemble the platter. Make piles of each of the vegetables, the cheese and the prosciutto on a large platter keeping the Calabrian chiles and the fresh mozzarella in separate bowls. 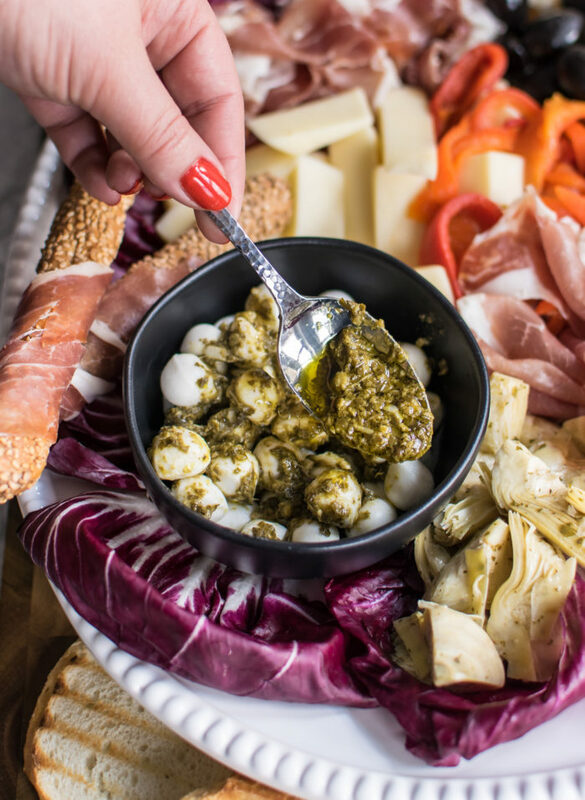 Spoon the pesto over the fresh mozzarella. Reserve a few pieces of prosciutto and wrap them around bread sticks.